With all the time you spend working and taking care of your family, there is no reason to lose precious time from your day with cleaning. Why spend time scrubbing the oven and washing the windows when you can call the Sears Maid Services to arrange for a one-time cleaning service, or if you prefer, a regularly scheduled service that will cater to your timetable. 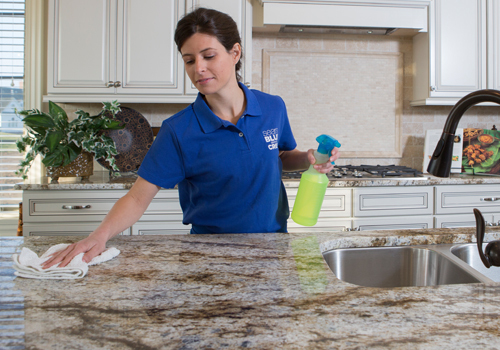 Sears Maid Services offers cleaning professionals that will add luster to your stainless steel, sparkle to your counter tops, and degrease even the hardest to reach areas. Whether it's the decorative molding, which has accumulated dusty cobwebs, or the ventilation grills that haven't seen a sponge in years, the staff at Sears Maid Services are the cleaning authorities you need to call. Sears hires staff members that are conscientious, courteous, and committed to doing the best cleaning job for you. Whether the maids are cleaning your office or your home, you can count on Sears to establish a great crew that works efficiently and promptly. Calling the Sears Maid Services for all your commercial and residential cleaning needs, is the first step to having more time for your family and yourself. Give us a call at (972) 439-8394. When there is a need for a regular service, one that can be scheduled on a weekly or monthly basis, consider Sears Maid Services. You can set-up your appointment schedule so that your home is cleaned and ready for any anything from parties or a weekend at home with the family. If you need a range of cleaning done for spring, holidays, and parties, the Sears regular housekeeping services will provide you with a staff of professionals to deeply clean your home. Whatever the need, dusting, vacuuming, cleaning the microwave or cook tops, Sears Maid Services will tackle the job without hesitation and with a professionalism that cannot be matched. Businesses are successful only when they exude professionalism. Clean restrooms, lobbies, meeting rooms, stairwells, hallways, and elevators, demonstrate a respectful and organized community. Business clients and personnel will appreciate the high standards you set for your company. Keeping your office free from disorganized clutter and unnecessary refuse is obtainable when you use Sears Maid Services. Our maid services have staff members trained in commercial cleaning and will perform cleaning duties to the same high standards you set for your company. Newly built homes demand an appearance of perfection in order to sell. During the construction period, nails, dust, wood shavings, smears, and chemical grime accumulate on carpets, walls and crevices of the new home. Getting your home ready for an open house requires thorough cleaning and the Sears Maid Services can help. The trained staff are ready to bring post construction clean up expertise to any new home. With proper cleansing, disinfecting, deep vacuuming, and surface washing, your new house will be ready for the market in no time. The trust that comes with customer loyalty is important to Sears. Because Sears has always stood by its products, you can rest assured that Sears will also stand by its services. The quality assurances that go into choosing an employee is of the utmost importance in the Sears hiring process. Every potential employee has been background checked and drug tested. Once hired, each employee is extensively trained. Sears is not only a trusted name but also a name that stands by its commitment. If you are ever dissatisfied with the Sears Maid Services, all you have to do is give a representative a call within 24 hours of the service, and someone will come out to address your issue. If any of the Sears Maid Services have been improperly addressed, Sears will rectify the issue at no extra cost to you.